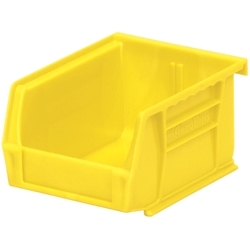 Akro-Mils Hang / Stack Bin, 5-3/8 IN. L, 4-1/8 IN. W, 3 IN. H, Industrial Grade Polymer, Yellow. Sold by the EACH. Industry leading hanging & stacking bins control inventory, shorten assembly times & minimize parts handling. Heavy-duty bins stack on top of each other, sit on shelving & hang from Akro-Mils racks, panels, rails & carts.